Another Quiz on Punctuation - Portions of the following sentences are written in bold type. Select the option which shows how that portion should be punctuated. Select The explanation, please! to learn the grammar rule(s) behind the correct answer. 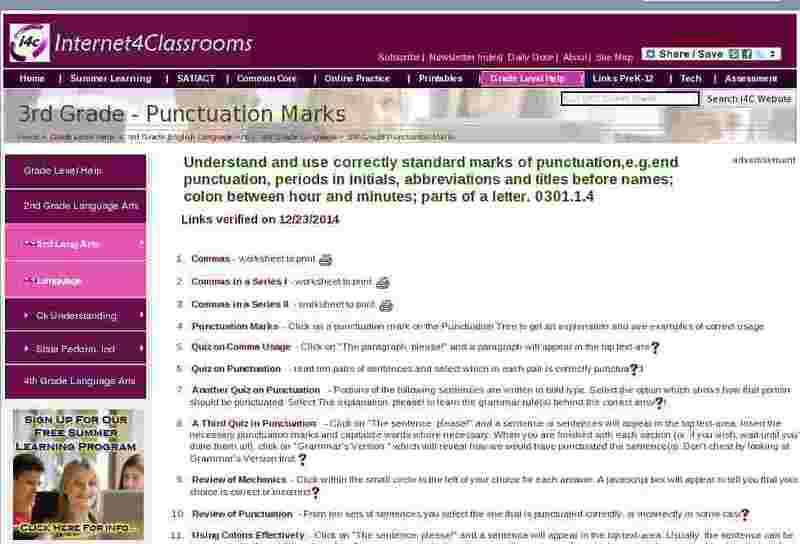 A Third Quiz in Punctuation - Click on "The sentence, please!" and a sentence or sentences will appear in the top text-area. Insert the necessary punctuation marks and capitalize words where necessary. When you are finished with each section (or, if you wish, wait until you've done them all), click on "Grammar's Version," which will reveal how we would have punctuated the sentence(s). Don't cheat by looking at Grammar's Version first. Review of Punctuation - From ten sets of sentences you select the one that is punctuated correctly, or incorrectly in some cases. Using Colons Effectively - Click on "The sentence, please!" and a sentence will appear in the top text-area. Usually, the sentence can be improved with the addition of a colon. Sometimes, though, the sentence will contain a colon which needs to be removed or placed elsewhere. A bit of rewriting might be necessary.